In traditional remarketing, you need to build an audience, create your ads and upload them to adwords. In order to create the ad you will need to fill some fields in adwords editor such as gifs, ad copies, banner pictures and destination URLs. 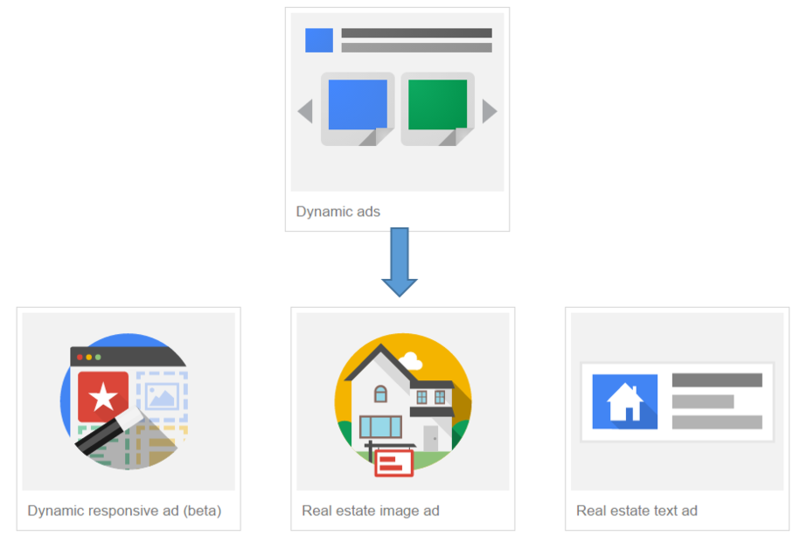 When a visitor match the audience rules you have built (for example: target anyone who sees a rental property), they will be retargeted with the ads you have uploaded in your account. Most of the times these are generic ads that aim to bring the user back to the web site and take an action such as submit a form or request a valuation of their property. In dynamic remarketing you populate all those elements automatically via the custom parameters. Custom parameters will send values in your adwords account dynamically based on information that can be found on the website’s source code. Visitors will then get targeted with relevant information based on the properties they’ve seen on your web site. Having said that, implementation of Custom parameters is your number one priority if you want to use Dynamic Remarketing as part of your digital strategy. Note: Custom parameters can have multiple values. listing_id [Required]: The Listing ID must match values from the Listing ID column in your web site feed. This allows the dynamic ad to show users the exact listing(s) they viewed on your site. Every property page should have its own unique listing ID. listing_pagetype [Optional]: Page Type indicates which page people visited. Standard values used for automatic list creation are: home, searchresults, offerdetail, conversionintent, and conversion. 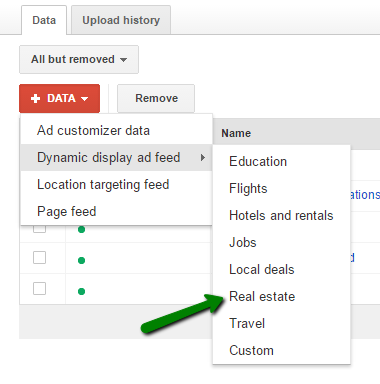 Note that adwords will create automatically remarketing audiences based on your listing_pagetypes. listing_totalvalue [Optional]: The total value of the listings viewed on your site. This could be the actual value of the property. Those values needs to dynamically populate based on the page the user is viewing (which is where the developer is needed). Analytics perk: you push these values via the GA tag and create Custom Dimensions. 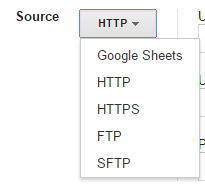 This is a super cool feature which enables in-depth analysis via Google Analytics. Setting up the custom parameters is the first step to Dynamic Remarketing. 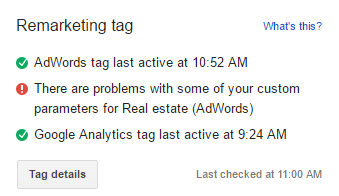 Now that you have done that, you need to upload the property listing feed to adWords. That feed effectively matches the listingID on your web site with relevant information you want to present on your ads such as the image, property price, property type etc. Listing ID: Required | we have already added this. I have an example in the doc attached. Image URL: Required | Format: JPG, JPEG, GIF, or PNG | if JPG, JPEG, or GIF must be used, image must be saved in RGB color code with an ICC profile attached to it. City name: Optional | String. Any sequence of letters and digits. | Can be displayed in ad. Recommended maximum length is 25 characters (12 for double-width languages). Description: Optional | String. Any sequence of letters and digits. | Can be displayed in ad. Recommended maximum length is 25 characters (12 for double-width languages). Once you have uploaded the file, you need to make sure that you add the feed URL for regular updates. This can be found again on the business data tab. Click on the Feed’s name and then click on the tab “Schedule uploads“. Remember we said that the final URL is recommended? This is because if you don’t do that, you will not be able to use product URLs as destination URL. 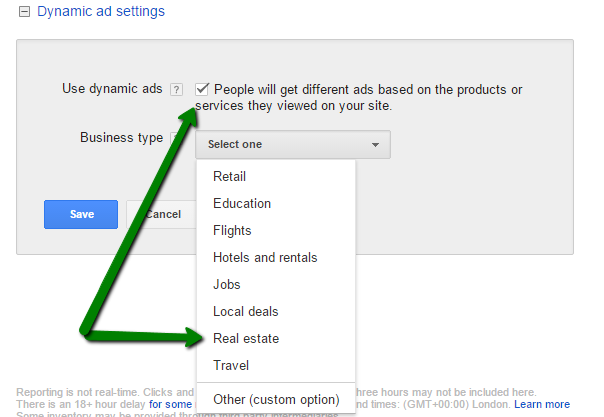 Go the Ads tab and from drop down section select “Ad gallery”, then select “Dynamic ads”. This will give you three different options: Dynamic responsive ad (beta), Real estate image ad and Real estate text ad. I am not a big fun of the Dynamic responsive ad (beta) atm, so let us use Real estate image ad. This will allow you to select if your dynamic ads will send users to a particular URL (for example the “contact us” page) or in the URL you have included in your feed (the property details page). Click Save, review your ads and have Remarketing.